This is our weekly summary of the main topics on Russia’s most watched TV news channels. The news shows’ agenda in Russia is carefully attuned to serve the Kremlin’s needs. 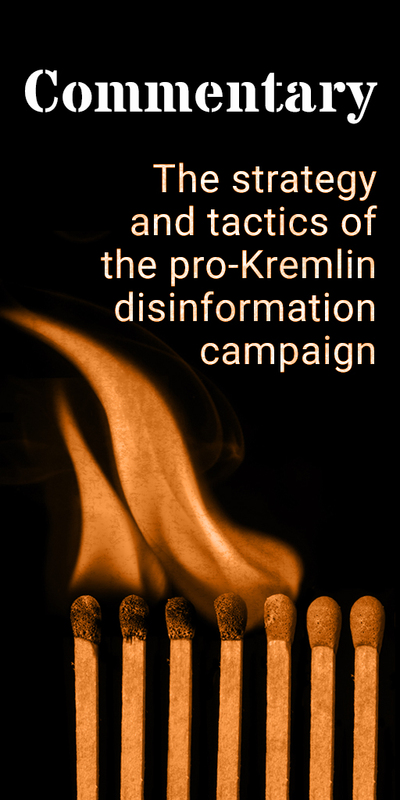 Therefore, following Russian state controlled media sheds light on our understanding of how the Kremlin seeks to influence the Russian-speaking audience in Russia and beyond. Read our story here. Our monitoring of pro-Kremlin disinformation also reveals that many of the themes set out in Russia’s most popular state TV news programmes find their way into European outlets. This week, a talk show discussed whether Russia should withdraw from the Council of Europe. The significance of the institution is compared to a discussion forum like Speaker’s Corner in London’s Hyde Park. Host Vladimir Solovyov calls the Council a “gay park”, echoing pro-Kremlin disinformation systematically labelling Europe as a “Gay-rope”. Another voice called the Council “an anti-Russian, Russophobe club”. “You’ve got to be a masochist to go there”, we learned. The show ridiculed Europe as a “source of moral authority”. The statement that for Russia, there is no home but a European one and Russia will be “either part of our European family or be orphans” was knocked out with the argument “these are words from a whorehouse, not a European house”. 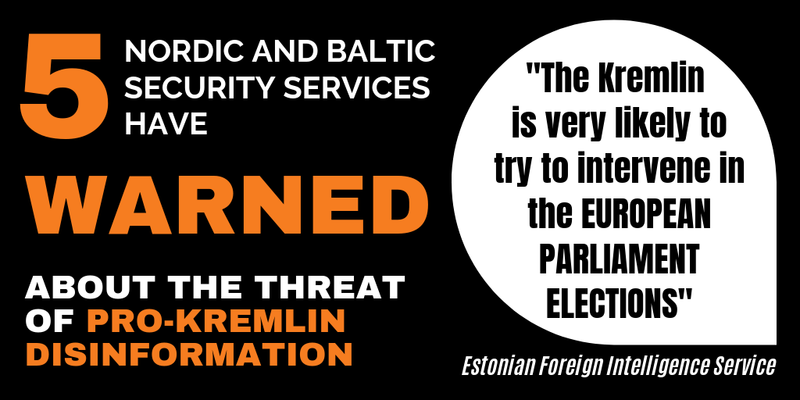 For background: In 2014, Russia’s voting rights in the Parliamentary Assembly of the Council of Europe were revoked after Russia’s illegal annexation of Crimea. This means the election of new judges and officials during the next two years would take place without Russian votes. As a reaction to this, the Russian Federation announced it would suspend payment of its contribution to the budget of the Council of Europe for 2017. Targeting Ukraine was again high on the TV agenda in Russia. A Ukrainian bill on reintegrating rebel-controlled parts of Donbas was talked about in terms such as “ethnic Russians being the genetic enemy” of Ukraine. We also heard a spokesperson of the “people’s council” in the self-declared Donetsk People’s republic hinting that we have to be ready “for a big war”. Other warnings – this time from the editor-in-chief of the Ukraina.ru website run by Russian state-owned media Rossiya Segodnya – included painting a picture of the West arming Ukraine and that in five years, Russia will have Europe’s strongest army on its border. The logic went that hence, Russia has to “seize the initiative” without waiting for an attack similar to the “Nazi surprise assault on the USSR in 1941”. Another talk show on TV Tsentr repeated these warnings when guests predicted an escalation of the conflict in eastern Ukraine into an all-out war. 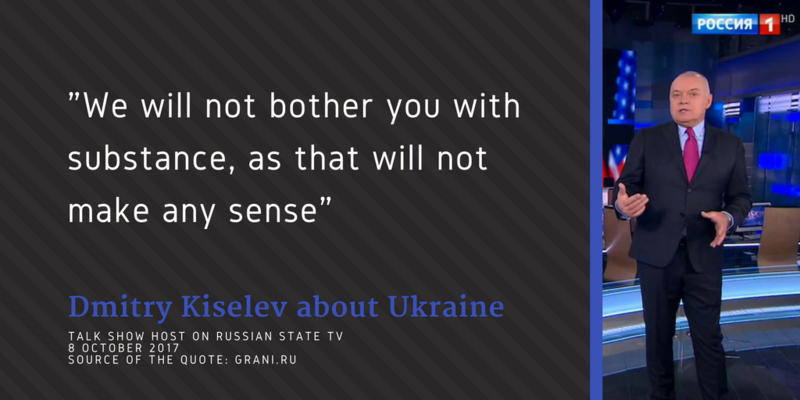 Ukraine is hostile to Russia, so we learned, and it intends to continue the war. This leads to recommendations on how Russia should act: “We should do everything to ensure that [Petro] Poroshenko and the current leadership’s regime will fall”, and “We should not be afraid if Poroshenko’s regime falls. Let the disorder there reach the absolute extent, let there be chaos, and let there be a ten-times-bigger Russophobe regime led by [Mikheil] Saakashvili’s”. After three years of clear proofs of Russia’s military support to the separatists in eastern Ukraine, Russophone television audiences still hear that “the Russian army would never go to fight” to eastern Ukraine. Russian TV continued to report about the Catalan independence referendum, which was presented as Madrid’s and the EU’s failures, and with the overall “European liberal ideology” to blame. The message was that Europe is divided by separatist movements, and risks splitting up even more. This was still the core message delivered to the TV audience. “Eurocrats fear civil war”, one correspondent stated. This is how the future of Europe may look like according to Channel 1. It showed 8 October 2017 a map where most of the western European countries are divided into parts. Another news programme on the NTV channel repeated the popular pro-Kremlin narrative comparing the European Union and the USSR and explaining that economic troubles and the rise of nationalism drive the “inevitable” centrifugal trends.